Did you ever watch Jack Bauer kill, maim, and torture America’s enemies on 24 and think, That man’s got a few things he needs to work out on an acoustic guitar? If so, you are a remarkably prescient person and should probably buy a lottery ticket, because Kiefer Sutherland is joining that storied pantheon of actors turned musicians and releasing his “folk-tinged” debut album this summer. He’s also going on tour, if you want to hear Down in the Hole (not One Day at a Time, Kiefer?) performed in person. 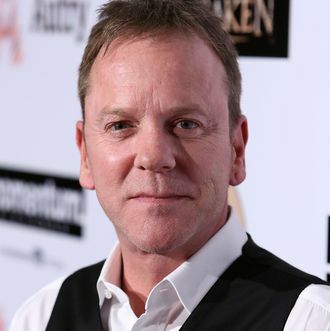 “All of these songs are pulled from my own personal experiences,” Sutherland said in a statement, which is good, because there are a lot of things from 24 that make for good folk-song material, like Jack Bauer’s catchphrase “Damn it, Chloe!” or that time his daughter was attacked by a cougar.